Chinese President Xi Jinping and his Afghan counterpart Hamid Karzai signed an economic and technical cooperation agreement on Friday in Beijing. 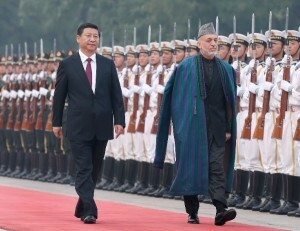 “The Chinese side firmly sticks to the Afghanistan-friendly policy, and stands ready to deepen the strategic and cooperative partnership with the Afghan side to benefit the people of the two countries and make contributions to promoting peace, stability and development in Afghanistan as well as the whole region,” Xi told Karzai. The two Presidents met at the Great Hall of the People in Beijing on Friday in the backdrop of growing global expectations that China will be a stabilizing force in the troubled region post the 2014 NATO pullout. 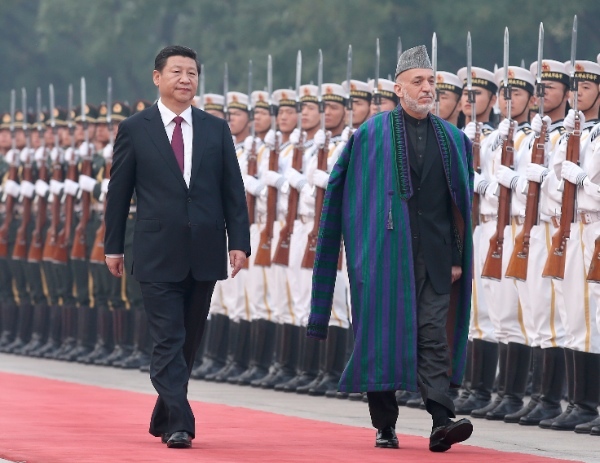 Karzai is on a state visit to China from Wednesday to Saturday. “The two sides will continue to strengthen their cooperation in the political, economic, cultural and security fields, and international and regional affairs,” according to a joint statement released Friday. Beijing signed a strategic partnership last summer with the war-torn country as Chinese investments in Afghanistan amounted to around $3 billion. “(China) will as always provide assistance to Afghanistan within the realm of its capabilities,” it said. China will provide a 200 million RMB (around $32 million) grant to the Afghanistan government for 2013. Xi said 2014 will be a key year for Afghanistan’s transition, reiterating China’s support for an Afghan-led reconciliation process. “The sides concerned should completely fulfill their commitment to Afghanistan’s peaceful reconstruction and respect the legitimate concerns of the countries in the region on relevant issues,” said the Chinese president. In April this year, China held a dialogue with India evolving a joint strategy to deal with the possible return of Taliban and al-Qaeda forces in Afghanistan after the departure of US troops next year. China and India also discussed the tapping of large mineral resources in Afghanistan, among major multilateral projects. China’s state-owned firms have invested heavily in oilfields and copper mines in Afghanistan. China Metallurgical Group Corp signed a $3 billion contract with the Afghan Ministry of Mines and Petroleum in 2007 to mine copper in the Logar Province, in what is billed as the biggest foreign investment in Afghanistan. During his visit, the Afghan president had separate meetings with Chinese Premier Li Keqiang and Vice Premier Wang Yang. Karzai also attended the opening ceremony of the 2013 Euro-Asia Economic Forum in China’s northwest city of Xi’an. China had earlier initiated huge training programs in trade, finance and agriculture for Afghan youth to study in China and Friday’s meet asserted this will receive a boost. Xi also told Karzai that the Beijing has decided to hold the fourth Ministerial Conference of the Istanbul Process on Afghanistan in 2014.